Today I thought I'd share another card I made for Operation Write Home with a fall theme. 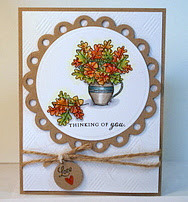 The focal stamp is from Papertrey's Autumn Abundance and colored with Copics. It was then cut out with a circle Nestablities, then matted with a kraft piece, also cut out with a Nestie. To add a little interest to the white background, I embossed it with a plaid impression plate from Papertrey. Finally I tied on a little twine (which seems fall-ish to me) and added a small tag using Papertrey's Tiny Tags die. Love that little heart the die cuts. I simply added a scrap of orange behind the heart to pop it a bit, the adhered the whole lot to a kraft card base. A pretty simple card, actually, but I think it expresses the season. What do you think? Thanks for stopping by. Now go do something creative! I really like this card! The image is so cute and the embossed white panel adds so much interest, and the little love tag is a perfect embellishment! Nice Job! !